In the present work, an approach based on fractal geometry, that has been successfully applied for the tensile and the compressive behaviour of quasi-brittle materials, is followed in order to obtain a fractal scaling from three-point bending tests of concrete specimens. 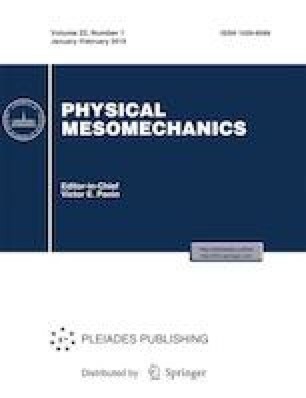 According to this approach, bending strength, fracture energy, and the critical kinematic parameter, represented by the localized rotation, are not defined with respect to canonical physical dimensions, but on fractal sets presenting noninteger dimensions. In the case of bending strength, the dimensional decrement of the reference area dG represents the weakening of the reacting cross section, whereas in the case of fracture energy the dimensional increment dG represents the roughness of the fracture surface. Furthermore, the kinematic parameter proves to be intermediate between a dimensionless rotation angle and a curvature, i.e., it moves from a generalized displacement to a deformation: its dimensional decrement dx represents the curvature localization along the beam span according to a lacunar fractal constituted by the infinite radial cracks converging to the center of curvature. As a consequence, the classical mechanical parameters are replaced by fractal quantities, which represent the actual material properties. Russian Text © Alberto Carpinteri, Federico Accornero, 2018, published in Fizicheskaya Mezomekhanika, 2018, Vol. 21, No. 6, pp. 49–54.